Redline Trading Solutions, the premier provider of high-performance market data and order execution systems for automated trading, was named Best Low-Latency Data Feed and received a Commendation for Best High Performance Data Feed Handler - Software at the Intelligent Trading Technology (ITT) Awards 2018. This distinction was determined by votes cast by the readers and financial institutional members of Intelligent Trading Technology to acknowledge excellence in within capital markets, and focus on the community of specialized suppliers of trading operations technology. RedlineFeed™ and InRush™ Accelerated Feed Handler are part of Redline Trading Solutions’s software offering that can be deployed as enterprise or a fully managed service leveraging an expansive, global footprint. RedlineFeed delivers multi-asset class, ultra-low-latency normalized market data via a single connection. InRush composites views on a fraction of a single server and delivers ultra-low latency intelligent trading events across asset classes. “RedlineFeed is powered by our proprietary transport protocol, which provides efficient distribution with minimal overhead, embedded snapshots, and is specifically designed for market data,” said John Hanna, Vice President of Sales & Marketing at Redline. 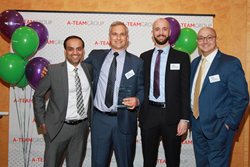 “Feedback from clients has been overwhelmingly positive, and we are proud to be recognized for Redline’s achievement with the receipt of the Intelligent Trading Technology Award,” he added. For more information, contact Redline at sales@redlinetrading.com. Redline Trading Solutions is the premier market access technology provider, delivering low-latency access to market data and order execution on over 150 venues. With flexible delivery models, Redline provides a comprehensive, end-to-end solution for multi-asset electronic trading with global market coverage, enabling smarter access to global liquidity. InRush, Redline, and RedlineFeed are trademarks of Redline Trading Solutions, Inc.
Other products mentioned may be trademarks of their respective holders.